Today marks the anniversary of the controversial Treaty of Paris of 1898. Controversial, because it involved the alleged “sale” of our country to the United States of América by Spain. Many Filipinos today, still bitter about our past which they do not fully understand, continue to blame Spain for treating us as a commodity when the former mother country “sold” us to the US for a paltry $20 million. As a backgrounder, there had been several treaties that were made in Paris throughout history, most of which were peace treaties between warring nations, and how those wars had to be concluded. The first Treaty of Paris happened in 1229 which ended the Albigensian Crusade while the most recent happened in 2015 but was all about climate change. Basically, the treaty that happened on 10 December 1898 followed the Spanish-American War in which Spain lost, thus forcing her to relinquish nearly all of her remaining territories to the US. These were Puerto Rico, Guam, and Filipinas (Cuba was never ceded to the US; she gained her independence four years later, but was still under the auspices of the future Imperialist). The cession of our country involved the abovementioned payment of $20 million from the United States to Spain. But was this exchange of money considered as a sale? The answer is in the negative. The keyword to understanding this is the word “cession” which appears three times throughout the text of the treaty, while its transitive verb (cedes/ceded) appears twelve times. Cession is not synonymous to sale. Generally speaking, cession means the act of giving up something, usually land or territory, by the agreement in a formal treaty, and this action is done usually after a war wherein a losing country might make a cession of part of its land to the victor. But sale has all the intents and purposes of selling something at the very onset. The fact still remains that Spain never intended to sell Filipinas nor any of her overseas territories in the first place. She was only forced to do so because she lost a war. Being the losing country, logic dictates that she didn’t have much of a say in the treaty. It should be noted that the Spanish delegates to the treaty tried the best that they could to retain at least parts of Filipinas. Initially, they had planned to cede only Mindanáo and the Sulú Archipielago. There were also suggestions to cede only Luzón. However, then US President William McKinley made it clear that the whole of Filipinas should be acquired. …to accept merely Luzón, leaving the rest of the islands subject to Spanish rule, or to be the subject of future contention, cannot be justified on political, commercial, or humanitarian grounds. The cessation must be the whole archipelago or none. The latter is wholly inadmissible, and the former must therefore be required. It is clear from the above that the US never intended to liberate us from Spain. It merely took over. But in the spirit of fairness (and perhaps as “consuelo de bobo“), the US paid Spain $20 million for the acquisition of Filipinas. Not to be a formal territory but as a mere colony. This was not the first time that the US and Spain had such a treaty. In 1819, the Adams–Onís Treaty was signed by the two countries following a heated border dispute. That treaty involved the cession of Florida, a Spanish territory, to the US. Also, it should be remembered that China’s Qing dynasty ceded Hong Kong and Kowloon to the United Kingdom following her defeat in the Opium Wars (1839–1842; 1856–1860). It is always obvious that losing countries do not profit from a war. The receipt of $20 million did not make Spain a superpower. But the acquisition of Filipinas by the United States marked Uncle Sam’s beginning as a world power. 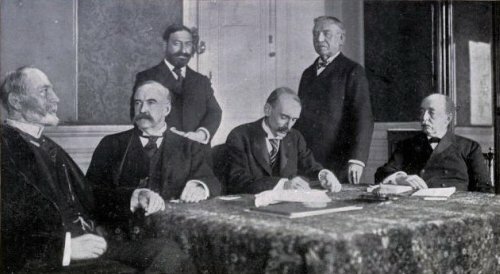 Members of the the American Peace Commission. Left to right: Whitelaw Reid, Sen. George Gray, John Moore (Secretary), Judge William R. Day, Sen. William P. Frye, and Sen. Cushman K. Davis. (photo: Arnaldo Dumindín). A line running from west to east along or near the twentieth parallel of north latitude, and through the middle of the navigable channel of Bachi, from the one hundred and eighteenth (118th) to the one hundred and twenty-seventh (127th) degree meridian of longitude east of Greenwich, thence along the one hundred and twenty seventh (127th) degree meridian of longitude east of Greenwich to the parallel of four degrees and forty five minutes (4 [degree symbol] 45′]) north latitude, thence along the parallel of four degrees and forty five minutes (4 [degree symbol] 45′) north latitude to its intersection with the meridian of longitude one hundred and nineteen degrees and thirty five minutes (119 [degree symbol] 35′) east of Greenwich, thence along the meridian of longitude one hundred and nineteen degrees and thirty five minutes (119 [degree symbol] 35′) east of Greenwich to the parallel of latitude seven degrees and forty minutes (7 [degree symbol] 40′) north, thence along the parallel of latitude of seven degrees and forty minutes (7 [degree symbol] 40′) north to its intersection with the one hundred and sixteenth (116th) degree meridian of longitude east of Greenwich, thence by a direct line to the intersection of the tenth (10th) degree parallel of north latitude with the one hundred and eighteenth (118th) degree meridian of longitude east of Greenwich, and thence along the one hundred and eighteenth (118th) degree meridian of longitude east of Greenwich to the point of beginning.The United States will pay to Spain the sum of twenty million dollars ($20,000,000) within three months after the exchange of the ratifications of the present treaty. This entry was posted in Filipino History and tagged Albigensian Crusade, cession, Opium Wars, Treaty of Paris (1898), William McKinley. Bookmark the permalink. The US has always made it a point that their invasion would be made to appear to be a result of an illegal or aggressive action (against them or an ally) or what could be perceived as violations of native rights and dignity. The Treaty was nothing more than a PR stunt which unfortunately was accepted by a defeated Spain. To call this treaty as a PR stunt is another accurate way of putting it. I remember asking Gomez about it. He’s got a good point. Spain no longer was in a position to negotiate. Also, the treaty was one way to not only legalize the annexation but assure Filipinos of proper turn over. This was important to US then and even now with their international policing and intervention. What was the mode of payment, Philippine gold? Probably in silver, or in pesetas. But to be honest, I’m not really sure. You better inquire about this from Ambeth Ocampo or Benito Legarda Jr. They both have Facebook accounts.